Consumers are in uproar after the latest upgrade to Mopey Rickard's top-of-the-range Deluxomatic Toasti-Friend toaster means that the appliance will no longer work with cheap bread. For many years now Toasti-Friend toasters have consistently come out top in consumer surveys and are an established brand leader in the luxury toaster category. 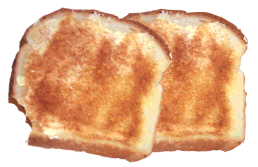 But official Toasti-Friend sliced bread is usually on the expensive side so most owners have opted for cheaper alternatives. The practice has always been against Mopey Rickard's recommendations, their advice being that cheap bread can clog the toaster's precision slots and cause the devices to explode. Despite this warning the only incident on record turned out, after investigation, to have been down to crumpet misuse. Now a firmware update that has been automatically installed by the manufacturer means that the posh toasters will only work with branded bread which contains an official ID chip. The company says that it has taken this step in the interests of its customers as the move will extend the life of the toaster. Their efforts might have been in vain, however, since some enterprising individuals have already found a way to circumvent the restrictions by hacking wholemeal and jailbreaking crusty baps.